April 9, 2019 10:45 am. Tabbed as the heir apparent to Justify before he ever ran, Roadster is now in a position to go for classic glory himself. The Bob Baffert trainee collared champion stablemate Game Winner in Saturday’s $1,000,351 Santa Anita Derby (G1) to assure himself a spot in the Kentucky Derby (G1) starting gate. Roadster entered the Santa Anita Derby with 0 points, like Justify last year, and needed a big effort to propel himself to Churchill Downs. Unlike Justify, Roadster ran at two, impressing in his debut at Del Mar but disappointing when third to Game Winner in the Del Mar Futurity (G1). It transpired that a breathing problem was to blame. With that fixed by a minor surgical procedure, Roadster returned with a good-looking allowance victory at Santa Anita on March 1. When Roadster drew the rail for his acid test in the Santa Anita Derby, his natural speed, plus the necessity of scoring Derby points, suggested that he’d go forward at least to secure position. But there was a plot twist right out of the gate. Roadster broke alertly, but eased back off the pace for Hall of Fame rider Mike Smith, and he dropped further back as the race unfolded. Meanwhile, Instagrand had taken up the front-running role, pressed by Nolo Contesto. Game Winner, the 1-2 favorite, was hung out wide in his bid to stalk the leaders. Instagrand tried to spurt away turning into the stretch, but the staying-on Game Winner was grinding his way to the fore. By that point, Roadster had gone into overdrive. From looking out of it entering the far turn, the Speedway Stable colt roared into the picture down the stretch and made it a three-way tussle. 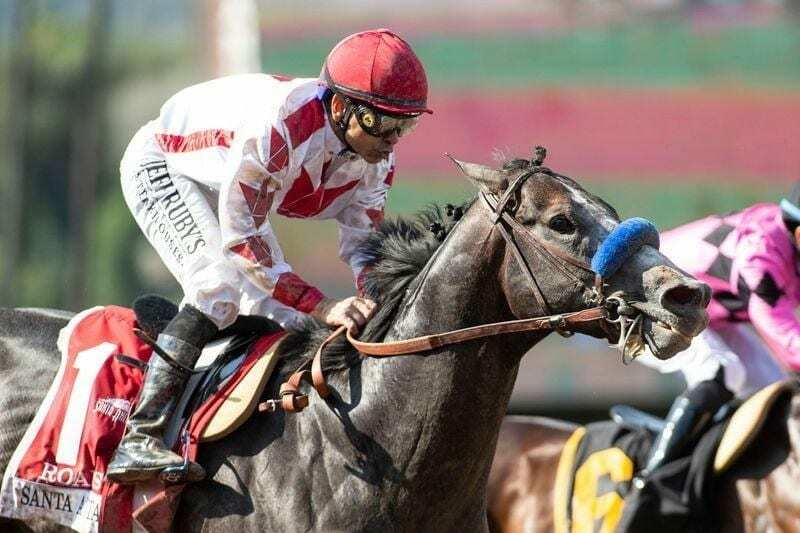 Instagrand’s stamina ebbed away first, ensuring that the finish would be fought out between the Baffert runners, each seeking to be the one to give their trainer a record ninth Santa Anita Derby. Game Winner kept up the fight, but Roadster found extra to get up by a half-length and take home 100 Derby points. His final time of 1:51.28 for 1 1/8 miles reflects how slowly the Santa Anita surface has been playing. Game Winner pocketed 40 for his gallant try in second, and he’ll head to Churchill Downs with 85 in the bank. “They’re two good horses,” said the Hall of Famer, who will go for a sixth Kentucky Derby trophy on May 4. “Game Winner was out there by himself and when he gets by himself…he needs company. It was a good, hard race for both of them, and coming in, that’s what you want to see. This track is deep and slow, but it’s safe, and that’s what we wanted. I couldn’t be happier. We knew that Roadster needed to win or run second (to have sufficient points for the Derby). “It was a great finish. They were both finishing well, they were fighting; Game Winner is a fighter. It was a great stretch run…at the eighth pole I knew I was going to win, I just didn’t know which one, but it was exciting. They’ll both like a mile and a quarter. I think Game Winner’s next race will be better. I’ve been bringing him along really easy. “Roadster is a light horse but always shown brilliance from day one. We’re just lucky we were able to bring him back, because after Del Mar I was worried that maybe the (throat) surgery didn’t go well, because it could’ve gone worse. But I couldn’t thank the surgeon that did it enough. He’s one of the best in the business and I’ve never had issues with it. His breathing is not an issue…Today he passed the test to know he’s good enough to go to the Big Show. “I left strategy up to my riders,” Baffert added. “(Joel) Rosario (on Game Winner) and Mike know what it is to be at that high level. They did not have any instructions at all. They were on their own and they know their horses. They rode great races…We’re there, we’ve just got to keep them happy and healthy, enjoy the ride, the moment. It’s hard to get to this moment. What I love the best is there’s not a better feeling than there was today. Instagrand reported home another 1 3/4 lengths back in third, good for 20 points. His total of 30 currently has him on the outside looking in at number 23 on the points list, if owner Larry Best and trainer Jerry Hollendorfer keep him in Derby consideration. The top three were well clear of the rest. There was a 5 1/4-length gap back to Nolo Contesto, who received 10 points in fourth. Longshots Synthesis and More Ice completed the order under the wire. Roadster was completing a Grade 1 double for sire Quality Road, also responsible for Saturday’s Santa Anita Oaks (G1) heroine and presumptive Kentucky Oaks (G1) favorite Bellafina. Roadster is a half-brother to Grade 1 turf victor Ascend, both produced by the stakes-winning Silver Ghost mare Ghost Dancing. Bred by Stone Farm in Kentucky, Roadster commanded $525,000 as a Keeneland September yearling, and he’s now amassed $706,200 from a record of 4-3-0-1.